From life-skill to sport, swimming is a sport that teaches valuable, life-long lessons. The initial investment of swimming—time, effort, commitment, equipment costs—yields a great return. According to the Fitbit Activity Index, swimming is the No. 3 fitness activity for all ages in Great Britain, No. 4 in Australia, and No. 7 in the United States. There’s no denying that swimming is popular, but here are the 8 most compelling reasons why swimming is such a valuable sport. Simply put, if you know how to swim you are less likely to drown. Teaching children to swim from a young age can literally save their life. According to the CDC, from 1999 to 2010 nearly 14,000 children drowned—40% of which were ages 1-4. The good news is that accidental drownings have decreased in recent decades thanks to widely adopted prevention strategies such as pool fencing and swimming lessons. It is not uncommon to find swim classes offered to children as early as 6 months old! The American Association of Pediatrics says children can safely take swim lessons as early as age 1. Even if your child doesn’t have aspirations of becoming a future Olympic swimmer, ensuring your child knows how to swim from an early age is extremely important. Becoming interested in the actual sport of swimming may just be an added benefit! The health benefits of swimming are practically unbeatable. In addition to improved body structure such as calorie burning weight loss, increased height, corrected posture, better coordination, increased flexibility, and joint health—swimming also helps boost the immune system thanks to increased blood and oxygen to your cells allowing them to more effectively remove toxins. Additionally, swimming also has a positive effect on the lymphatic system allowing it to regularly distribute white blood cells resulting in increase immunity against diseases and infections. When it comes to chronic diseases like arthritis, swimming improves the use of affected joints without worsening symptoms. Hydrotherapy is often used on patients with Rheumatoid Arthritis and decreases pain from Osteoarthritis. Exercise-induced asthma sufferers also find swimming beneficial because it allows them to workout in moist air that reduces symptoms. Swimming requires breath control and also improves overall lung and breathing capacity because certain strokes encourage lung function. Club or squad training swim programs have extremely regimented training schedules that make time management crucial to fitting everything in each day. Being that swim training is mainly conducted before and after school children need must learn to allocate time for travel to and from training while not interrupting their daily routine. Tackling training, school, homework, family—as well as rest—is a difficult juggling act for even the most dedicated athlete. Balancing a difficult schedule is certainly a valuable skill, especially when learned at an early age! Participating on a swim team can build strength, confidence and the ability to get along with others all while competing in an exhilarating individual sport. At each meet, competitive swimmers try to beat their personal best times, while at the same time swimming for their team as a whole. Everyone needs to develop the important skill of working with others to accomplish a combined goal so why not do it while having fun and getting exercise? After School sports are generally a great way to keep kids out of trouble after school. Since swimming is a year-round sport, kids can be involved in club swimming over the summer and join their schools swim team in the fall. 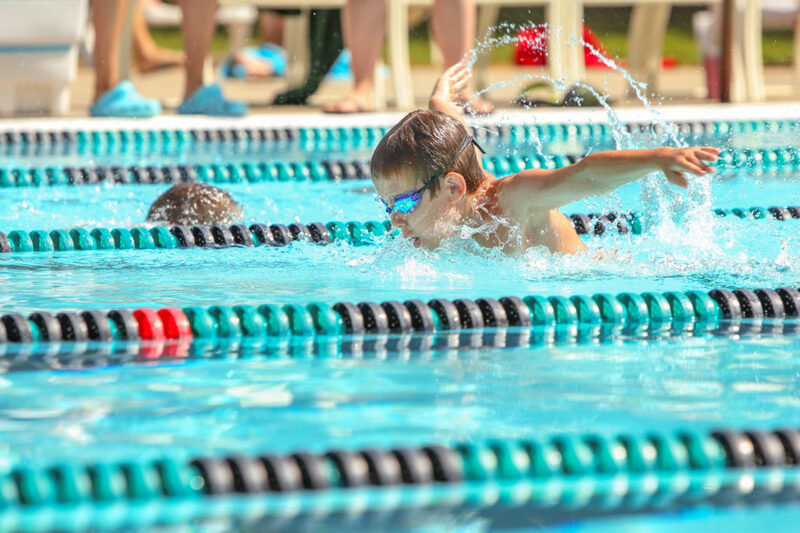 Having a structured activity like swimming over the summer where kids can experience the results of hard work and dedication will bleed over into the upcoming school year and enhance academic abilities and aspirations. During the school year, a swim team offers a safe, encouraging and supportive space for kids who would otherwise go home to an empty house after school. It gives children a sense of belonging and value as well as a constructive outlet for energy, frustration, and anxiety. Unlike more physically demanding sports, swimming is not a weight-bearing activity making it perfect for those suffering from arthritis or joint pain. Swimming also lessens the possibility of heatstroke or heat exhaustion in older individuals. There are many types of water-based exercises that increase flexibility and stamina which can lead to improved health in seniors. Not only is swimming a sport that you can adopt at a later age, it is an effective and safe way for seniors to be active without putting undue strain on their bodies. Swimming can also benefit muscular and cardiovascular systems and is perfect for supplementing land-based exercise in order to increase weight loss. You’re never too old to learn something new, and in this case, the benefits are too good to overlook. Just be sure to check with your healthcare practitioner before attempting any kind of strenuous activity. Stepping into the water and moving around renders you ageless! Physical activity improves mood in children and adults. Swimming can help decrease stress and anxiety in those suffering from conditions like fibromyalgia while relaxing, strengthening and toning muscles. For pregnant women, water-based exercise can have a positive effect on the mothers’ mental health. Jumping in a pool can also provide an enormous amount of relief from the pressures of everyday stresses. The aerobic benefits of swimming help your circulatory system function more optimally, leading to better blood circulation to your brain. If your brain gets enough blood and oxygen it starts a process called hippocampal neurogenesis in which cells from the hippocampus that have been lost due to stress are replaced with new cells. You’ve heard the quote, “I cannot fly, but swimming is the next best thing. The water is my sky.” -anonymous. Swimming feels just like flying—weightlessly gliding through the water gives you the same sense of freedom and liberation! Parrot Sports Gear is a leader in swim supplies with a unique line of activewear by TYR Swimwear. Visit our online store today! This entry was posted in Swimwear and tagged activewear, swim supplies, swimwear. subject that has been written about for ages. Great stuff, just excellent!